Our Easter celebration took place this GOOD FRIDAY, 14th APRIL 2017 (happy birthday to HM Queen Elizabeth 2nd). 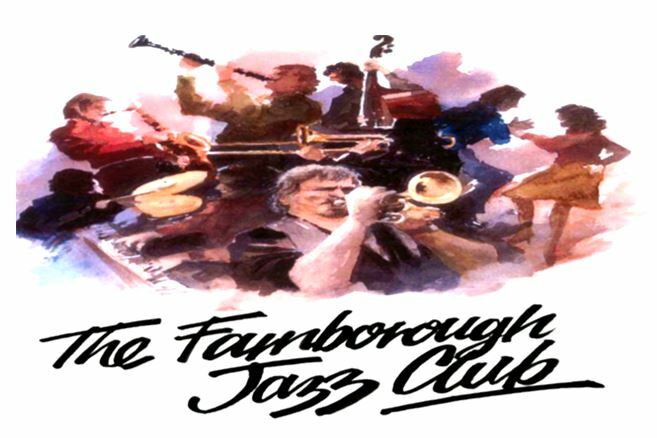 BOB DWYER’S BIX & PIECES jazz band made sure we enjoyed the start of our holiday here at FARNBOROUGH JAZZ CLUB. Trombonist &vocalist BOB’s phone was temporarily out of order, so was not sure of who was to be playing, however I actually got it wrong – he did in fact have CHEZ CHESTERMAN on trumpet, with JOHN ELLMER on clarinet & tenor sax, HUGH CROZIER on piano &vocals, including JOHN BAYNE on double bass &bass sax, DAVE PRICE on banjo &guitar and GRAHAM CAULICOTTE on drums. I asked if you could all have a quick look here on Friday afternoon and hopefully, I would have been able to confirm these guys would be playing for you, but sorry, I didn’t have time to check it out. I can tell you we all enjoyed good dancing, good raffle prizes (all who came had a chance of winning Easter Eggs and some booze too). I also have to apologise for being unable to keep up with how these recent Fridays have been and what tunes were played, but have house renovations taking place and have little spare time. Hopefully I might get back to it all again. 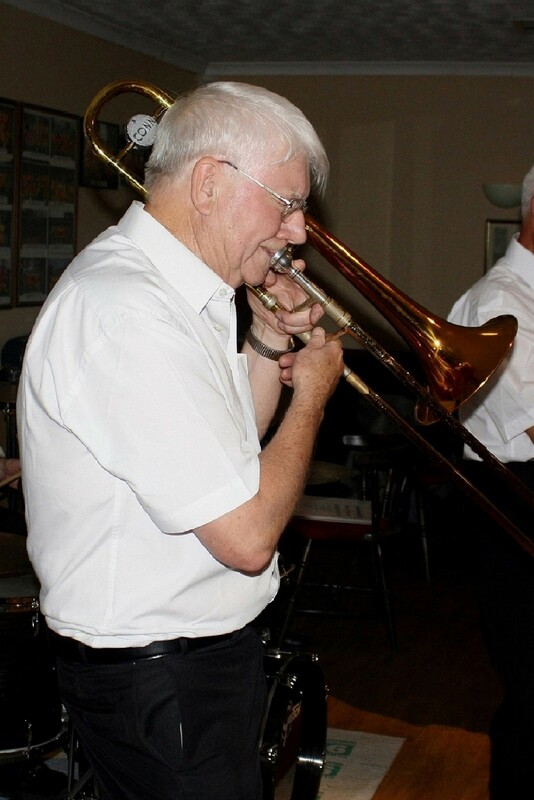 Now, It is with much regret, I have to tell you that Michael & Silvia Murtagh have lost their own Sunday jazz club they have spent much energy and love running at Welling. They have been running jazz for far too many years than I can remember. So Keith and I thank them and, wish them luck in whatever they care to disperse their energies into – Michael is still editor for the Just Jazz Magazine, which obviously takes a lot of work for them both too. 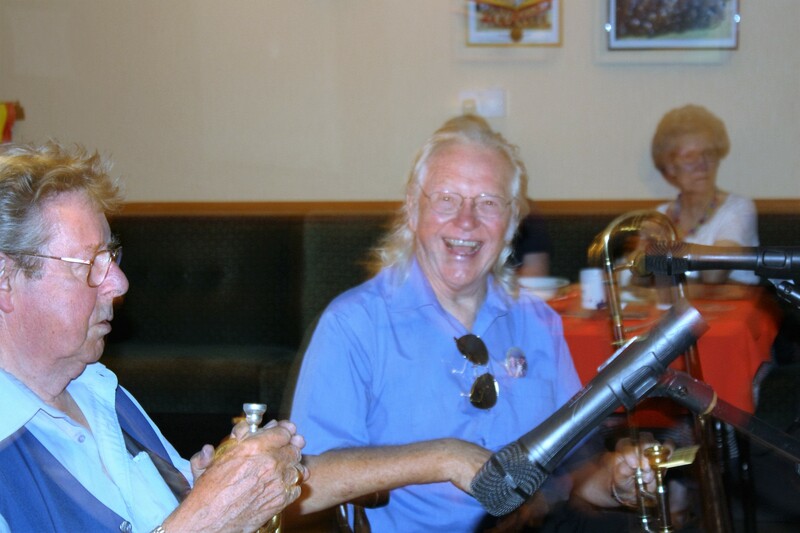 How about this photo of our beaming ‘Kid’, George Tidiman on trombone, seen here with Ken Simms on trumpet. Taken at Farnborough Jazz Club (Kent) on 22nd July 2016 with his own band, George ‘Kid’Tidiman’s All Stars. Photo by Mike Witt. 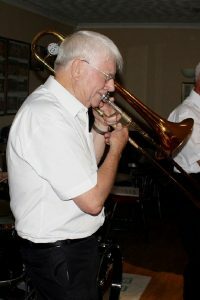 Also, I expect by now, most of you will have heard of the death of dear Ken Simms, trumpet player. Ken last played for us here at Farnborough with George ‘Kid’ Tidiman’s All Stars – as you can see by this photo, on 22nd July 2016. We are proud to have known Ken -truly a star- for many years. Keith had played with him on many occasions in the past. Our sympathy goes out to his family. Continue to enjoy your Easter holiday and see you all next week. See you Friday’s – be Good. This entry was posted in Bob Dwyer's Bix & Pieces on April 12, 2017 by Diane.